Left 1916 by the artist at the Gallery Dalmau, Barcelona; Dalmau family, Barcelona; purchased 1953/1955 by Stephen Hahn and (Janis Gallery, New York); sold 1955 to Nelson Aldrich Rockefeller, New York; sold to (Marlborough-Gerson Gallery, Inc., New York); purchased May 1970 by NGA. The details of the provenance are provided in a letter of 10 February 1970 from Daniel Robbins to J. Carter Brown, copy in NGA curatorial files. 29me Exposition, Société des Artistes Indépendants, Paris, March-May 1913, no. 1293. Erster Deutscher Herbstsalon, Berlin, September-December 1913, no. 147. Galerie Dalmau, Barcelona, 1916, no. 31. New Arrivals From France, Sidney Janis Gallery, New York, 1955, no cat. Albert Gleizes 1881-1953: A Retrospective Exhibition, Solomon R. Guggenheim Museum, New York; Musée National d'Art Moderne, Paris; Museum am Ostwall, Dortmund, 1964-1965, no. 40 (New York cat.) and no. 18 (Dortmund cat.). 20th Century Art from the Nelson Aldrich Rockefeller Collection, Museum of Modern Art, New York, 1969, unnumbered catalogue. The Cubist Epoch, Los Angeles County Museum of Art; The Metropolitan Museum of Art, New York, 1970-1971, no. 98, pl. 63. Aspects of Twentieth-Century Art, National Gallery of Art, Washington, D.C., 1978-1979, no. 14, repro. Stationen der Moderne: Die bedeutenden Kunstausstellungen des 20. Jahrhunderts in Deutschland, Martin-Gropius-Bau, Berlin, 1988-1989, no. 3/18, repro. 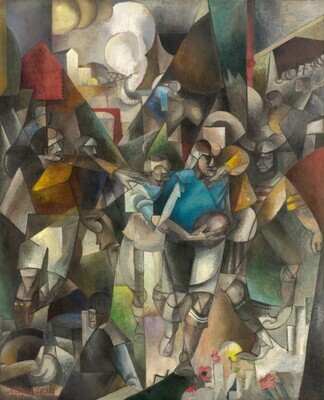 Albert Gleizes: El cubismo en majestad, Museu Picasso, Barcelona; Musée des Beaux-Arts, Lyon, 2001, no. 37, repro. The Avant-Garde in Danish and European Art 1909-19, Statens Museum for Kunst, Copenhagen, 2002-2003, no. 24, repro. Le Futurisme à Paris: une avant-garde explosive, Centre Pompidou, Paris; Scuderie del Quirinale, Rome; Tate Modern, London, 2008-2009, no. 59, repro. (shown only in Paris). Der Sturm - Zentrum der Avantgarde, Von der Heydt-Museum, Wuppertal, 2012, unnumbered catalogue, repro. "Au rendez-vous de poetes" Apollinaire et la naissance de l'art moderne, Musée d'Orsay, Paris, 2016, no. 98. Apollinaire, Guillaume. Apollinaire on Art: Essays and Reviews 1902-1918. Edited by Leroy C. Breunig. Translated by Susan Suleiman. New York, 1972: 282, 285, 292, 338. European Paintings: An Illustrated Summary Catalogue. National Gallery of Art, Washington, 1975: 154, repro. Robbins, Daniel. "The Formation and Maturity of Albert Gleizes: A Biographical and Critical Study, 1881-1920." Ph.D. dissertation, New York University. Ann Arbor, 1975: 113-114, 163-164. Buckberrough, Sherry A. Robert Delaunay: The Discovery of Simultaneity. Ann Arbor, 1982: 167-171, no. 60. European Paintings: An Illustrated Catalogue. National Gallery of Art, Washington, 1985: 179, repro. Albert Gleizes: catalogue raisonné. 2 vols. Paris, 1998: 1:148, no. 404, repro. Pinkus, Karen. “Sport." In Encyclopedia of Comparative Iconography: Themes Depicted in Works of Art. Edited by Helene E. Roberts. 2 vols. Chicago, 1998: 2:856.